Through the jasmine-scented roads of L’weibdeh (Jordan) I navigated my way to Abeer Seikaly’s studio, an old house that resembles Jordan’s genuine and inspiring identity. Abeer Seikaly is a young Jordanian architect who has been featured on several global and local media platforms because of her innovation “Weaving a Home” that was shortlisted for the 2012 Lexus Design Award. Top architecture schools in the Arab world are heavily influenced by international trends in built environment and sustainability, and unfortunately Arabic reference material is largely ignored in teaching. The emerging thinking around built environment and its relationship with people and nature rely largely on digital and virtual practice leaving students with minimal interaction with communities and building materials. Moreover, the growing disconnect between research and market requirements in most developing countries magnifies the gap between engineering and sustainable development. Acknowledging the uniqueness of traditional Arab architecture and its historical importance in shaping sustainable building concepts raises concern on the diminishing role of local knowledge in responding to contemporary sustainability challenges. For Abeer, having the chance to study abroad provided her with new insights not only about architecture but more importantly about her own potential and abilities within a larger context. What her culture-rich home environment gave her, on the other hand, was respect and appreciation for art, creativity and surroundings. With time, exposure and experimentation, Abeer defined her own architecture. Emphasizing that the pure definition of technology is craft, weaving, and making, her definition of innovative architecture combines old and new, traditional and contemporary. It is also thinking about architecture as a social technology. When people are focused on the product, they usually tend to neglect the joy and benefit of the process itself. Focusing on the process boosts self-confidence and self-awareness and yet requires diligence and mindfulness while enjoying experimentation. It enables us to engage more deeply with the present, and thus, allow us to learn faster and experience life to the fullest. As a firm believer in the process, Abeer Seikaly has been working on her creative structural fabric for years. When the time was right, she used this creative work to bridge a gap in human needs. Participating in the Lexus Design Award was part of engaging her fabric with people and nature. 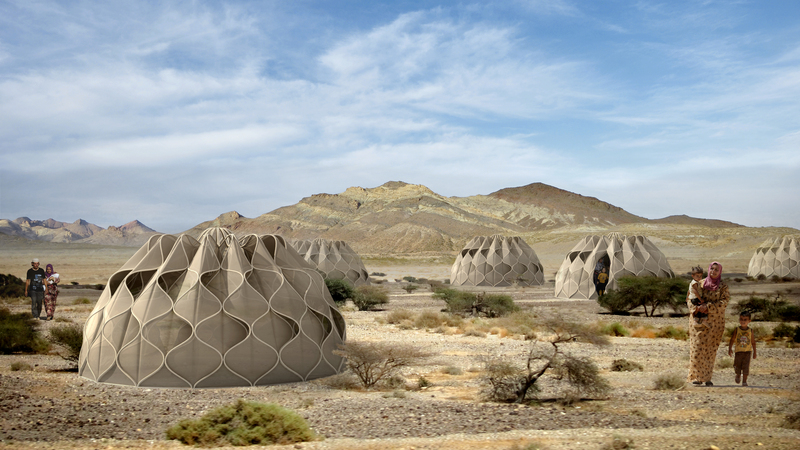 Disaster shelters have been made from a wide range of materials, but Abeer turned to solar-absorbing fabric as her material of choice in creating woven shelters that are powered by the sun and inspired by nomadic culture. The use of structural fabric references ancient traditions of joining linear fibers to make complex 3-D shapes. Tackling an important issue like shelter for a humanitarian purpose can’t be more relevant to both innovative architecture and sustainable development. With Jordan being host to more than 1.4 million Syrian refugees, this is about humanizing architecture and meeting basic human needs. Abeer has explained everything about her fabric and its use in disaster relief on her blog. She passionately mentions her ultimate inspiration: thinking through making. “Experimenting, looking at material’s behavior, testing, and slowly you are there”, says Seikaly. “It is about thriving and not about surviving. Revelation results from years of hard work and continuous perseverance throughout the process”, she adds. There is no recipe for innovation, Abeer Seikaly explains, but Jordanian engineers and architects need to ask themselves the following: What are you about? What is local/sustainable? What is Jordan about? When asked about role of engineering firms, Seikaly stressed the fact that most corporations nowadays do not provide an enabling environment for youth to learn and grow. Emphasizing the importance of innovation, she says “With no personal attention and coaching, engineers are disconnecting from themselves and from community. Despite all the difficulties we face in our country, innovation goes back to personal drive and motivation: if you need it, you will make it”. “Define your role as an Architect in a developing country, I have discovered mine and became an aware human being. To serve society and improve well-being is who I am”, concludes Abeer. The straightforward link between architecture and sustainable development goals is Global Goal No. 11 i.e. Sustainable Cities and Communities; nevertheless, a deeper look at how architecture influences and gets influenced by other elements brings about a link with almost each of the other Global Goals. The unique relationship between built environment, people and nature makes it an opportunity to demonstrate real sustainable development, as highlighted by Abeer Seikaly’s innovation. Around 60% of the world’s population will be living in cities in 2030 which dictates a new and integrated way of thinking about urban design and architecture. This entry was posted in Development, Engineering, GlobalGoals, innovation, Jordan, refugees, Ruba Al Zu'bi, SDGs, SocialGood, Sustainability, women, الاردن and tagged architecture, GlobalGoals, Jordan, Ruba Al-Zu'bi, SDGs, sustainable development on December 13, 2015 by rubazubi.